More than 2,400 Virginians are waiting for a life-saving transplant right now. 40% of Virginia adults have not yet registered. Learn more about the process, how to register and other frequently asked questions below. What is organ, eye and tissue donation? Organ, eye and tissue donation is the process of recovering organs, eyes, and tissues from a deceased person and transplanting them into others in order to save the lives or improve the health of those in need. Up to eight lives can be saved through organ donation, and another 75 lives or more may be improved through tissue donation. There are currently more than 115,000 people in the U.S. waiting for organ transplants. Each year, approximately 8,000 people die waiting for an organ transplant that would have given them a second chance at life. Additionally, each year hundreds of thousands of people benefit from donated tissue that is used for life-saving and reconstructive purposes, and corneas that restore sight. Skin is used as a temporary dressing for burns, serious abrasions and other exposed areas. Bone is used in orthopedic surgery to facilitate healing of fractures or to prevent amputation. Heart valves are used to replace defective valves, often in children. Tendons are used to repair torn ligaments on knees or other joints. Veins are used in cardiac bypass surgery. Corneas can restore sight to the blind. Many tissues that cannot be used for transplant can be recovered and used in a variety of research studies to advance medical science. Yes. Donation saves lives every day. Hundreds of Virginians have organ transplants each year and receive a second chance at life. Approximately two citizens in the Commonwealth die every week waiting for the gift of an organ that does not come. How can one person save 8 people? By becoming an organ, eye and tissue donor at DonateLifeVirginia.org one person can donate a heart, two parts of a liver, two kidneys, two lungs, intestine and a pancreas. One tissue donor can enhance the lives of more than 75 people. Living donation is when a living person donates an organ or part of an organ to another person. The living donor may be a relative, friend, spouse or an in-law. Or, the donor may be a stranger that has volunteered to help someone else. Living donation usually involves one of these organs: a segment of the liver, the lobe of one lung, a kidney, or a portion of the pancreas. Living donation is an alternative for individuals awaiting organ transplantation from a deceased donor. You can find more information on living donation here. 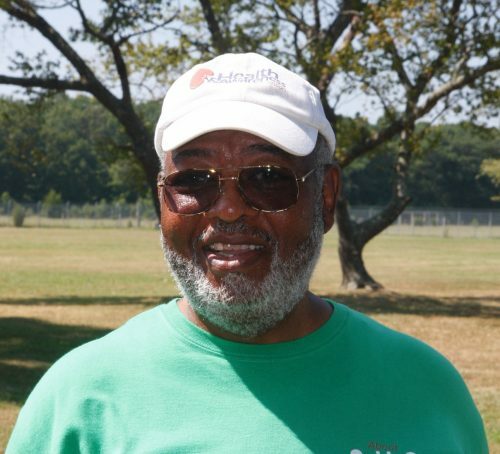 Wallace Green, of Chesapeake, Virginia is a Navy veteran and two-time kidney transplant recipient. Am I too old or unhealthy to donate? No. Anyone can be considered for donation. Many people erroneously believe they cannot donate due to a past medical history or age. At the time of death, donation program professionals will review your medical and behavioral history to determine if you are a candidate for donation. There is such a critical need for organs currently in the U.S., the criteria for donation are changing constantly. In most cases anyone can be a donor. To date, the oldest donor was 101 years old. That is why it is so important to continue to check YES at the DMV when you renew your driver’s license or identification card every single time. Will my decision to be a donor affect my medical care if I am injured or sick and admitted to the hospital? No. By law, the doctors who work to save your life are not the same professionals who are involved in transplantation and organ donation. If you are sick or injured and admitted to the hospital, you will receive the same level of care regardless of whether or not you have indicated your wish to be an organ, tissue and eye donor. The doctors treating you are not involved with transplant programs or possible recipients. In addition, doctors and hospital staff DO NOT HAVE ACCESS to the Donor Registry. Only donor program personnel can access the Donor Registry – not the medical professionals taking care of you. If I register to be a donor, how can I be sure that I’ll really be dead when organs and tissues are recovered? Do famous or wealthy people get transplants quicker? No. The organ allocation and distribution system is blind to wealth or social status. A national computerized matching system is used to place available organs with potential recipients. This current system is administered by the United Network for Organ Sharing, located in Richmond, Virginia. National policies govern the sharing of organs in the U.S. to ensure all patients fair and equal access to transplantation. The length of time it takes to receive a transplant is influenced by a variety of factors including location, severity of illness, physical characteristics (blood type, weight, genetic typing, and size) and length of time on the waiting list. Factors such as income or celebrity status are never considered when determining who receives an organ. All major religions support organ, tissue and eye donation and consider donation the greatest gift one can give. Transplantation is consistent with the life preserving traditions of these faiths. The donation of life is an act of human kindness in keeping with religious teachings. Is there a black market for organ donation? Can I get paid for my organs? There is no evidence of such activity ever occurring in the United States. According to the National Organ Transplant Act of 1984, it is illegal to buy or sell human organs in the U.S. Violators are subject to fines and imprisonment. In addition, a national governing body reviews every organ donation and transplant. Strict regulations prevent any type of “black market” existence in the United States, and the World Health Organization, among others, has strongly condemned such practices abroad. Are TV and movie stories about donation true? In general, the TV and movie industry sensationalize and distort information about donation and transplantation. Remember these mediums are designed to entertain audiences and are not the best way to learn the facts about any particular subject. If there is not an organ match when I die, can the surgeon take my organs and store them until they find a match? No. If a match cannot be found for your organs, then they are not removed from your body. Your internal organs can only be outside of the body for a short amount of time, and there is no way to preserve them to be used later. If I donate my entire body to science, can I still be an organ, eye and tissue donor? Not at this time. Currently, a body that is donated for scientific research under The State Anatomical Program cannot be used for organ, eye and tissue donation, except in the case of corneas. However, you should still register your decision to be an organ, tissue and eye donor in the Donor Registry in case your body is not accepted in the Anatomical Program. Your family can also ask the recovery agency at the time of donation if there may be other whole body donation options after organ, eye and tissue donation has occurred. Organizations that offer those kinds of services must be approved by Donate Life Virginia or their activity is illegal in the Commonwealth. Does my family have to pay for the donation? No. Donation costs nothing for the donor or the donor’s family. While the family will receive a hospital bill for any lifesaving efforts that took place for their family loved one, if that patient dies and becomes a donor, all charges related to the donation process are billed to the organ, eye or tissue recovery agency. There can be an open casket funeral, viewing or other standard memorial after donation. The donor is treated with utmost respect and dignity. The recovery of organs and tissues is conducted under standard, sterile conditions in an operating room, and the body is fully reconstructed once organs and tissues are removed. The family will make the funeral arrangements in the usual fashion. All funeral costs remain the responsibility of the family. Any costs that may be associated with donation are paid for by the organ, eye or tissue recovery agency. Will my family still have the final decision? No. Your decision to be a donor will be honored. The Code of Virginia states that family permission is not required when you have documented your decision to donate. While it is still helpful for family members to know what you want, their permission will be sought only if your decision is not registered, either through the DMV or online at DonateLifeVirginia.org. Those under the age of 18 can indicate their wishes to donate, but parents and guardians by law must make that decision. Organs and tissues that are not recovered for transplant may be used for medical research if the donor (or family, in lieu of a Donor Registry record) authorizes it. Non-transplantable organs and tissues help researchers every day find new ways to treat disease. A gift of organs and tissues for research can affect untold numbers of patients who benefit from the medical advances that result from their use in the laboratory. Virtually every disease that plagues mankind is being studied today with the help of donated human organs and tissues that cannot be transplanted. How can I list what organs and tissues I have decided to donate? If I donate my organs, will the recipients know who my family is? The identity of all parties is kept confidential until both parties agree to release identifying information to the other. The donor family and the transplant recipient may receive such information as age, gender, and state of residence. Individually, the recipient may be told the circumstances of death, and the donor family may be informed of the transplants that were performed and receive feedback on how the health and lives of the recipients have improved. The organ, eye and tissue recovery agencies facilitate correspondence and meetings initiated by either the donor family or the recipient at any time, but only if both parties agree to it. The American Association of Blood Banks (AABB) web site states that “A blood donation truly is a “gift of life” that a healthy individual can give to others in their community who are sick or injured. In one hour’s time, a person can donate one unit of blood that can be separated into four individual components that could help save multiple lives.” To find out more about where to donate blood locally, use AABB’s locator. How can I become a bone marrow donor? Is it possible for me to make an organ donation while I am alive? In Virginia, all transplant centers who perform kidney, liver or lung transplants also evaluate the living donor potential of friends and family members of patients on that center’s waiting list. If medical suitability and willingness is determined, then the donation and transplant takes place at that center.Additionally, in the WRTC service area of northern Virginia, the Washington Regional Voluntary Living Donor Program will facilitate a kidney pair swap, a swap to the waiting list or an anonymous donation. The donation is then allocated to the local waiting list and can be facilitated at Inova Fairfax Hospital in Fairfax, Virginia. You should call the center where the patient you know is listed in order to determine whether living donation is an option. You can get more information on living donation standards for both transplant centers and for living donors from the United Network for Organ Sharing. How can I donate my whole body to science? You can give many gifts in your lifetime, but there is one that will make a significant and lasting contribution, the gift of donating your body to medical science. This can be accomplished through the Virginia Department of Health’s State Anatomical Program. You cannot participate in this program after having donated organs and tissues. How do I make changes to my registration if I signed up at the DMV? At any time, you may visit the Donor Registry at DonateLifeVirginia.org, click on “Update My Info,” and log in with your Driver’s License or State ID number and birth date. You will then be able to add a password, change some personal information, specify donation limitations or remove your name from the Virginia Donor Registry. It is, however, always important to share with your family and friends your decision about organ donation. If anything does happen to you, your family members will be told about your decision and will be asked to help answer questions about your medical history. Can I specify at the DMV which organs and tissues I have decided to donate? The DMV is the main point of contact with the Donor Registry for most Virginia citizens, and there is only enough time for a visitor to the DMV to say yes to donation. There is not enough time to make any additional decisions. All specific limitations must be completed by going to the Donor Registry at DonateLifeVirginia.org, where you click on “Update My Info,” enter your log-in information and make the changes you wish. What if I have already said “yes” to donation at the DMV, do I need to register again online? No. All donor designations from the DMV are securely uploaded into the Donor Registry. The only time you need to go to DonateLifeVirginia.org is to make changes in your registration. Must I register to be a donor again when it is time to renew my driver’s license or ID? NO! Once you designate your desire to be a donor, it will remain unless you remove yourself from the registry. If I sign up as an organ, tissue and eye donor at DonateLifeVirginia.org, will the DMV receive the donor information? No! Donor designation stays in the Donor Registry only and is not transferred to the DMV. If you ever wish to have the donor heart symbol put on your driver’s license/ID you must request to have that done by the DMV either at their office or on its website, but it is not a requirement for being a designated donor. I signed up to be a donor at the DMV, but I did not get a heart on my license/ID — what should I do? Mistakes sometimes happen. If you do not have a donor heart symbol on your driver’s license/ID you should go to DonateLifeVirginia.org to check your designation. It is most likely not going to be there. You can register on the Donor Registry website at that time online for free, or you can go back to the DMV and, for a small fee, ask for a replacement license/ID. If something should happen to me while I am traveling, what role does my donor designation on my driver’s license/ID play? All matters concerning organ, eye and tissue donation are under the jurisdiction of each state’s or country’s respective laws. While your Donate Life Virginia registration might not serve as legally binding consent for donation outside Virginia, it will serve as a clear indication of your wish to donate and will be shared with your family when they are approached by the local organ recovery agency in the state where you die. Is my information private and secure online? Yes. The online database of donors at this website is held in a confidential and secure site, protected by the most up-to-date web security standards. All information submitted will be used only by donation and recovery professionals and will be kept completely confidential. This information will not be shared or sold. How do I make changes to my registration if I sign up online? If you sign up online, the screen that confirms your registration displays your unique Registration ID and Password. If you sign up at the DMV, your driver’s license number acts as your Registration ID number. At any time, you may visit the Donor Registry website, click on “Update My Info,” enter your log-in information, and make the changes you wish. I made a mistake on my registration, and I am unable to change it when I “Update My Info”. To protect your identity, the Donor Registry will not allow changes to key pieces of personally identifying information, such as your name and date of birth, once you have signed up. You will need to re-register. Having multiple registrations is not a problem. We will simply consider the most recent registration to be the binding one. I don’t want to sign up by using a computer. Is there any other way to register? In addition to registering online, you may download a registration form to complete and mail, or you may register when you apply for or renew your driver’s license or ID card through the DMV. I have an advance directive authorizing donation of my organs. Should I also register with the Donate Life Virginia Registry, or will the advance directive be enough? In order to ensure that your loved ones are aware of your decision to be an organ, eye and tissue donor, we suggest that you also designate donation either by signing up at the DMV or online at DonateLifeVirginia.org. How do you ensure that someone does not sign up another person without his or her knowledge or consent? In all the state/district donor registries currently in operation, to date there have been no reported problems with persons registering people other than themselves. The authenticity of the registrant can be determined using the date/time of the registration, and personal information requested during the signup process. Family members are also consulted at the time of donation and will be able to verify the donor’s information. If I am between the ages of 13 and 18 years old, can I sign up at DonateLifeVirginia.org? Yes. Anyone between those ages can join DonateLifeVirginia.org. If a child 17 years old or younger dies, a parent or guardian will make the final decision concerning organ, tissue, and eye donation. Federal law prevents anyone under the age of 13 from signing up since it is illegal to ask a child for personal information online.